To start the school year with sustainability in mind, Dominican University introduced composting in Caleruega Dining Hall. Dominican faculty members, Alice Cochran, M.Ed., and John Duvall, Ph.D., were instrumental in orchestrating a collaborative effort to launch the compost program this past August. In recent years multiple factors lined up for Dominican to kick start their efforts including a state composting bill (AB 1826), a student research project, support from the faculty/staff Sustainability Committee, and a willing partner in the Epicurean Group, Dominican’s food service provider. 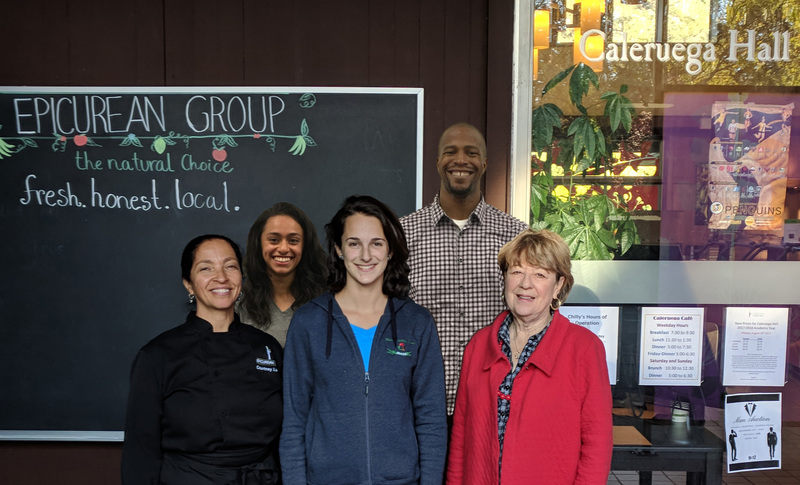 Epicurean Group, students, faculty and staff at Dominican, and Marin Sanitary Service were all active players in implementing Dominican’s composting program. Now instead of 4 landfill bins, there are 4 compost bins and just one small landfill container adjacent to the bins! Over 100 students pledged to start composting prior to its launch, and the staff and students who eat at Caleruega are happy with the change and have adjusted to the new system. Since starting this program, Dominican has diverted almost 2 tons of material per week from going to the landfill. Because of their efforts, the Caleruega Dining Hall was able to reduce their landfill bin by 25% and is looking for more ways to reduce their waste. Read the full article with tips and resources here. Worked in collaboration with Epicurean and Marin Sanitary to develop a feasible composting program. Had campus support from Dominican students, faculty and staff.